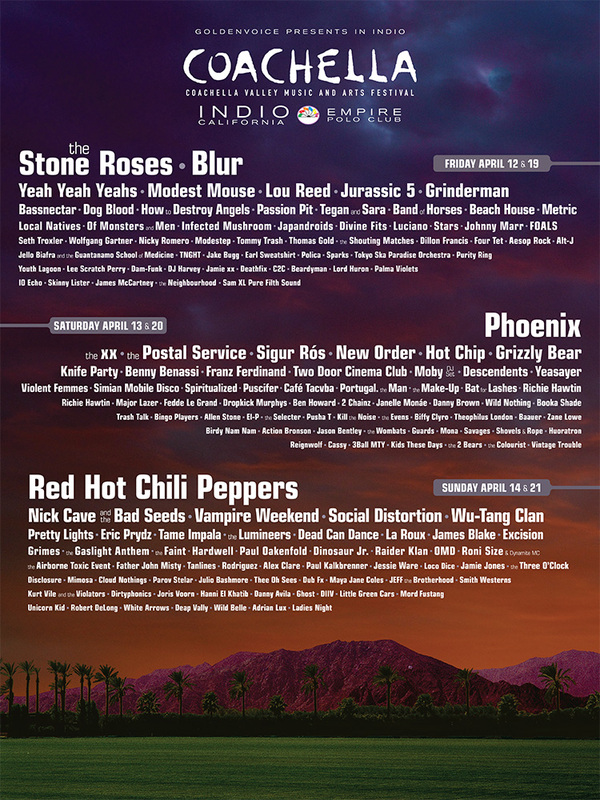 This great divide led us to wonder which of the 177 bands playing Coachella is driving ticket sales. 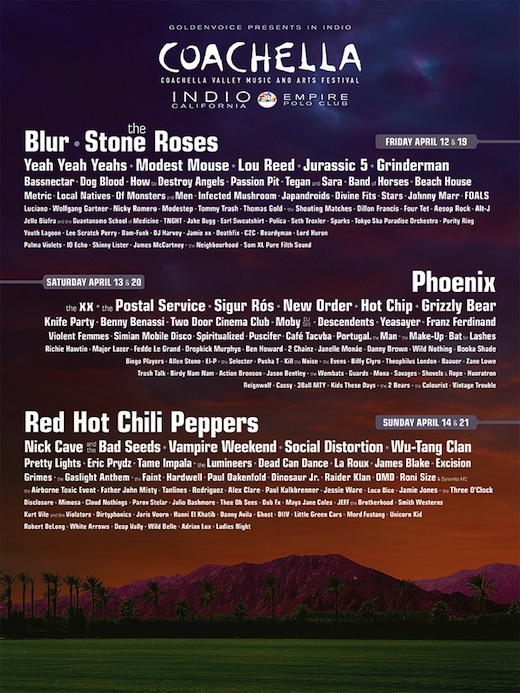 So we set out to measure just how popular this year’s lineup actually is, band by band. But what to measure? Record sales? No, everyone sells exactly 0 of those. We needed something that tracked loyalty, and for Millenials, which Coachella fans predominantly are, that meant Facebook. Using the Coachella roster we recorded each band’s placement on the lineup (each tier represents the line of the poster the band appears on) and their number of Facebook fans. Below are the charted results. Are the most popular acts are getting their proper share of the spotlight? For the most part, yes. First up, the headliners. Despite some grumbling on the internet, The Red Hot Chili Peppers trump every other festival band with over 20m certified Facebook Likes. Phoenix and Blur also appear in top 10%. Only the Stone Roses don’t make it into the over-a-million-fans club. From there, Facebook Likes decline steeply through the primetime and opening acts. Though, there are a couple of outliers. Some of the most “liked” bands are not headliners. German DJ Paul Kalkbrenner has the second highest number of Facebook fans (right after RHCP! ), but falls within the middle section of the primetime acts. Similarly, Cafe Tacvba from Mexico has over 1m Likes, but a robust international audience has seemingly little impact on headlining in California. Then there’s Nick Cave. He plays twice during the festival with two different bands: Grinderman and Nick Cave and the Bad Seeds. Both bands have the same billing placement, but the latter has nearly 700k Facebook fans—10 times as many as Grinderman. We should also mention a few other anomalies: bands that weren’t on Facebook at all (there’s eight), and, like in the case of Jurassic 5, bands that had an auto-generated community page, meaning they’re not maintaining an official Facebook page, but people are liking them anyway. By the way, the band Sparks has both, but we used the official Facebook page fan count.